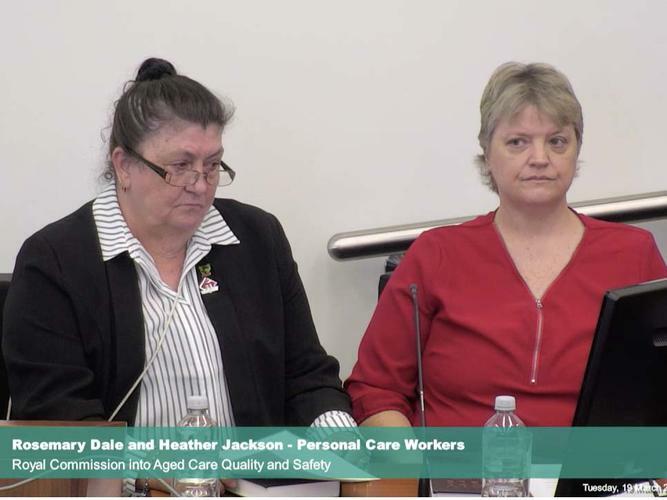 Four personal care workers fronted the Royal Commission into Aged Care Quality and Safety yesterday to share concerns for their safety, as well as the need for better wages and more training to attract the next generation of aged care workers. Heather Jackson, who has worked in the aged care sector for 24 years has expressed safety concerns to her workplace on evening shifts and as a result has recommended an emergency beacon to be carried by aged care workers. “We are living in a different world now. “Afternoon shifts and evening shifts are getting bigger in this industry,” she says. Rosemary Dale, a Grade 3 health care worker for nearly a decade also shares safety concerns. “At the night time it can be quite scary,” she says. With the demand for a stronger aged care workforce, the Commission was told better wages and increased training could help gain and maintain aged care workers. “The wages don’t cut it,” Ms Jackson says. She also says when she first started working in aged care, the training was quite good, but now workers are required to complete 10 online modules a year, in what she describes as a “tick and flick”. Sally Warren agrees the aged care sector needs a major overhaul. “For the work we do, the pay doesn’t reflect that at all. Ms Warren also believes Certificate 3 in Aged Care should be a minimum training requirement for aged care workers. “These are human lives we are dealing with,” she says. Despite these concerns all women expressed a genuine care for their clients and love for their jobs to the inquiry. “I value my work, I value my clients and I want to help them stay in their homes for longer,” Anna Hansen says. “We [aged care workers] come into this industry because we genuinely care about people. Ms Warren, a former policewoman loves her job and says she never thought she would work in the aged care industry. While Ms Dale says building relationships with her clients has allowed her to learn from them as well. “I love this job. These people give back as much as what we give them. Manager of Social Policy, Municipal Association of Victoria Clare Hargreaves told the Commission on Tuesday that local councils are well positioned to support older Australians in their communities and help avoid vulnerable members from slipping through the cracks. Her proposal would see local councils, Governments and the Commonwealth working together to ensure all members within the community receive the support they need to remain in their homes longer. “The key problem we see with the current individual service is some individuals receive very good service and others receive none … and no one is responsible for this following up. “Our experience is that older people absolutely value people talking to them in their home, trust in their provider and continuity of care. She says home care services have previously worked very well at local level with councils able to deliver immediate support to those most in need, particularly in rural communities. Ms Hargreaves says a block funding approach for home care ensures continual access, a move the Municipal Association of Victoria is a strong advocate for. The association is looking to strengthen intergovernmental partnerships to make sure there are enough providers in each municipality able to provide the range of services that are needed by older Australians living in Victoria. The Commission heard local Governments and councils can more reliably deliver home care services within their communities to ensure hard-to-reach and difficult clients don’t “drop off” the list. Hearings will recommence today at 10am.